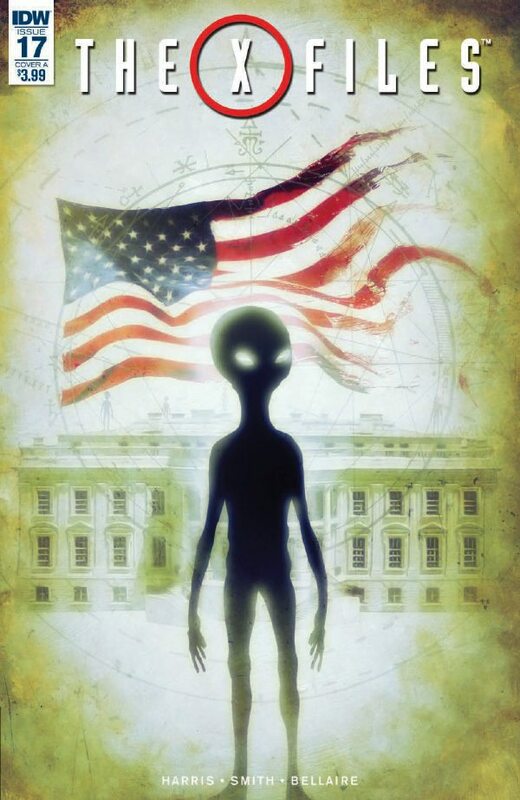 Unlike the main series from which it spawned, The X-Files comic run from IDW draws to a monthly close after almost eighteen months, since the series returned for the first revival. ‘Resistance’ part four marks the culmination of a mythology arc which has by necessity trodden a difficult balance; attempting to forge its own corner of the alien mythos with the Old Ones and their ‘holes in the sky’, much more Lovecraftian in scope than Chris Carter’s B-movie 50’s tropes reborn in the main show, while not interfering with the primary narrative still unfolding for Agents Mulder & Scully and their ongoing search for the truth. Joe Harris, by and large, has successfully managed to give these run of comics their own style and flavour while feeling like an extension of the series itself. This final issue takes everything Harris has built on and culminates in a time old, nebulous X-Files fashion, as mysterious alien forces schism over their dominance of a broken political system they are exploiting for their own ends, with Mulder & Scully sort of putting the pieces together while never being entirely certain of anything, as Skinner is forced to capitulate to a new, hard-line, authoritarian Presidency in how the FBI is dealt with. Sound familiar? It’s strange how Harris has been criticised for his IDW run being ‘too political’ when The X-Files is a show mired in and reflective of the murky politics which America has experienced since, significantly, the end of the Second World War. Maybe Harris’ significantly liberal, anti-Trump views are just a little too close to home for some people. For me it shoots these comics through with a contemporary sense of commentary, satire and bravery. Think about it. At the time of writing, a day before the issue is released, North Korea just fired missiles over Japanese airspace. Harris’ final issue concerns a growing US/North Korean standoff exacerbated by alien forces only Mulder & Scully vaguely get to grips with. Rarely has a comic been so unexpectedly well-timed to tap into such an anxious zeitgeist, as it were. Harris’ writing, as always backed up by Matthew Dow Smith’s haunting, striking panels, is unafraid to be mythic and layered, even if at times he sacrifices plot and clarity for polemic and enigma. That’s what makes his stamp on The X-Files so interesting and original and why, as ‘Resistance’ as probably the strongest singular story in this continuation run proves, his own voice will be missed depending on where X-Files comics go from here. So as the curtain comes down, remember this entire continuation run is essential reading for any fan of The X-Files, and ‘Resistance’ caps off an excellent ‘series finale’. Get them solo, get them in trade, but get them, as the guys as IDW have crafted some fantastic extensions of this great show over the last few years and have kept the flame burning. As a team, Joe Harris, Matthew Dow Smith, Jordie Bellaire, Chris Fenolglio, Denton Tipton and more, you will be missed and thank you, on behalf of all X-Files fans reading. The truth is that you did good.